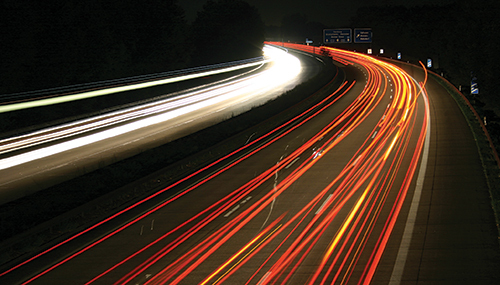 » home » magazine » 2015 » december 2015 » automotive still revving, but is it sustainable? In September, a Precision Metalforming Association Tennessee District meeting provided the opportunity to assess the current strength of the automotive manufacturing sector in the Southeastern United States and tour some of that region’s metalforming operations. Safe to say that the region remains healthy, a fact confirmed by discussions with several producers and suppliers at the 2015 FABTECH show this past November in Chicago. For example, at North American Stamping Group’s massive, sparkling Plant No. 2 in Portland, TN, crews were busy preparing for a new mechanical press. The new press joins a row of large mechanical presses from Eagle Press & Equipment Co., Ltd., Oldcastle, Ontario, Canada, the largest at 1300 tons. With a soon-to-be-completed expansion underway at a plant in Mexico, including addition of a 1500-ton Eagle Press, NASG’s manufacturing footprint will include 1.1 million sq. ft. across stamping facilities in Canada, Ohio, Indiana, Tennessee and Mexico, totaling nearly 100 press lines. With its progressive- and servo-transfer-stamping prowess, along with welding, finishing and assembly capabilities, the Tier Two is a major supplier to the North American vehicle market. Products include exhaust and seat components and assemblies, ride-control stampings, door hinges, body and engine mounts, inner and outer vibration components and brake components for passenger and commercial vehicles. Just down the road in Portland, as covered in the June 2015 issue of MetalForming (beginning on p. 18), Hatch Stamping Co. opened a new 120,000-sq.-ft. facility featuring three stamping lines anchored by mechanical presses from Nidec Minster, Minster, OH. The 250-, 350- and 1000-ton lines supply automotive seat-assembly brackets, tracks and seat-related mechanisms; ABS and other braking components; and fuel-system brackets, straps and rings. The investments by NASG, Hatch Stamping and others show that the industry expects to remain strong and even grow. These predictions have remained accurate thus far, but a new industry report, the 2015 Automotive Tooling Update, an analysis of the automotive supply chain by the Original Equipment Suppliers Association (OESA) and manufacturing consultant Harbour Results, Inc. (HRI), suggests caution. • With an unprecedented number of North American vehicle launches scheduled for 2017, 2018 and 2019—40, 49 and 39, respectively—resources will be constrained. • A shift to low-volume vehicles with a high product mix will result in 80 percent of models produced in annual volumes below 100,000 units by 2018. • Growing complexity and the demand for new and innovative technology, coupled with automaker price pressures, are putting the squeeze on Tier One supplier profitability. The study, primarily focusing on how the tool and die industry will be impacted, also points to other stressors across automotive. Specific to tooling suppliers, OESA and HRI point out that the Detroit Three automakers have less than 45 percent of the North American market share, down from 87 percent in 1962. That’s a telling stat, as North American tool suppliers largely supply the Detroit OEMs, while other OEMs receive their tooling chiefly from overseas. That is seen as shifting to North America, but slowly. With more models coming out, and more of these models in smaller volumes, current production and supply models will be stressed, claim the report authors. And through all of this, the product itself is becoming more complex. For example, a particular molded front fender produced in 2005 required seven molds and fewer attachment points, with most of those of the lower-detail variety. In 2015, the fender for this same model required 12 molds and more than four times the operations, and with more attachment points, most of those more complex. Materials required to produce new models also continue their rise in complexity, as use of medium- and higher-strength steel has increased 24 percent in the past four years while aluminum usage has increased 17 percent. The trend should continue into 2022 as automakers attempt to satisfy government fuel-efficiency standards. If that weren’t enough, shorter product lifecycles continue to trend, and are expected to drop further over the next five years. These shorter lifecycles translate to less time to amortize tooling and other capital. One way Tier suppliers can recover those costs is through higher piece prices, but that’s easier said than done. So it’s no surprise that all of these complexities have cut into profits of automotive suppliers. For the tool and die industry, the factors listed above are compounded by challenges such as increased tool complexity, shorter lead times, lack of skilled labor, tooling jobs on hold, capital equipment needs and cash-flow management. 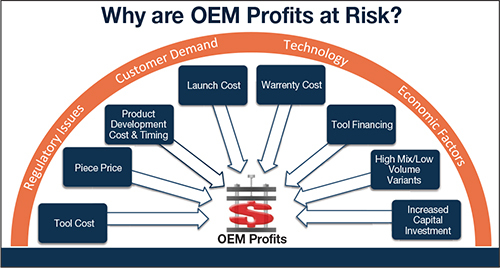 To manage their increasing tooling expenditures, OEMs will use a variety of cost-cutting tactics, according to Laurie Harbour, HRI president and CEO, including intense pricing pressure on tiers and tooling suppliers. OEMs also may opt to cut future programs, source tools overseas, communize platforms and components to harmonize tooling, use alternative tooling materials, and create a low-volume supply base.